Though Ryder claimed that such images derived solely from his imagination, his friends observed him taking midnight strolls to get the moonlight effects. Ryder lived in New York City for his entire artistic career but he chose to depict the opposite of the rapidly urbanizing world around him in these paintings—cows on grassy fields and quiet visions of the sea under the light of the moon. Milton Brown, The Story of the Armory Show, 2nd ed. (New York: Abbeville Press, 1988), 98. Ryder had shown at New York venues such as the National Academy of Design, the Society of American Artists, the Metropolitan Museum of Art, and the Union League Club during the 1880s and 1890s. The network of patronage and Ryder’s role in artistic circles at this time has also been analyzed by Saul Zalesch, “Ryder Among the Writers: Friendship and Patronage in the New York Art World, 1875-1884,” Ph.D. diss, University of Delaware, 1992. Roger. E. Fry, “The Art of Albert P. Ryder.” Burlington Magazine 13 (April 1908): 55, 59, 62-64. See also Sadakichi Hartmann, “A Visit to Albert Pinkham Ryder,” ArtNews 1 (March 1897): 1-3. Brown, 116. Ryder was still alive, but he had generally stopped producing new work after 1900. Arthur B. Davies, a key organizer of the exhibition, was a friend and champion of the artist. Contemporary observers described Davies delightedly leading Ryder through the exhibition in New York. 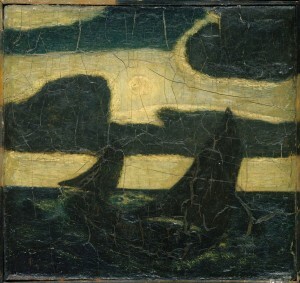 Elizabeth Broun, Albert Pinkham Ryder, exh. cat. (Washington, D.C.: Smithsonian Institution, 1989), 4. Unfortunately, Ryder often created his paintings without regard for technical precision and permanence, so that some have darkened considerably over time, losing much of the original nuance in tone and color that attracted early admirers. See conservation report notes included in object file for Moonlight Marine, Metropolitan Museum of Art, accession number 34.55.